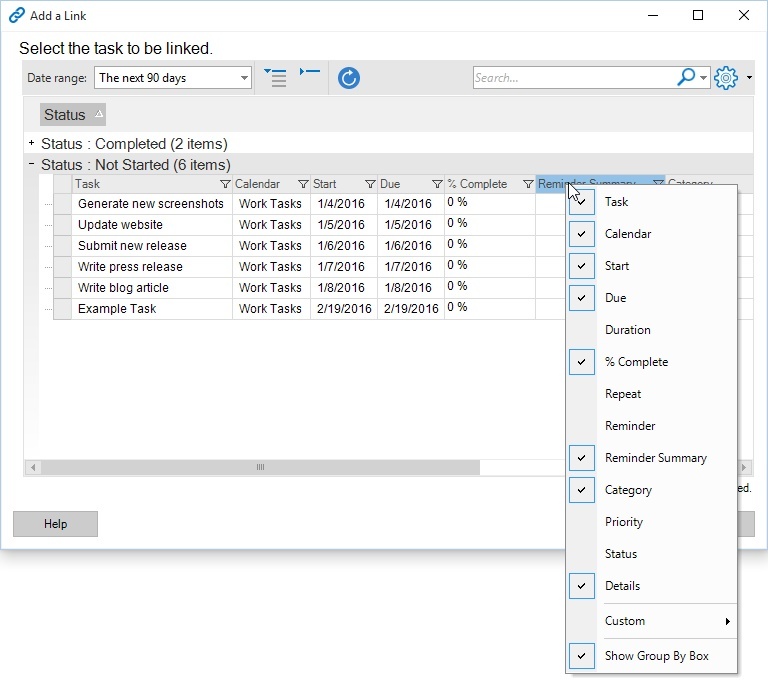 Link to an existing event, task, note, or contact by using the "Link Existing" button at the top of the Links tab in the Event Editor, Task Editor, Note Editor, or Contact Editor. When the Links tab view type is set to List, right-click in the Links tab and select the desired link type from the "Link Existing" submenu. 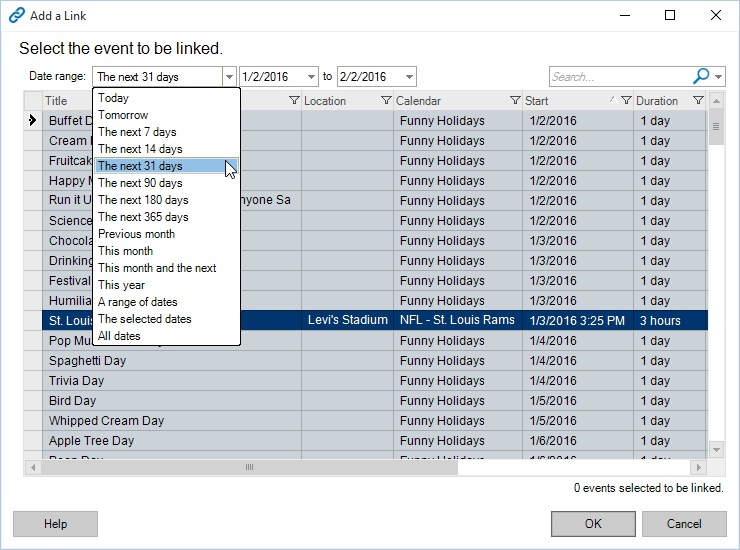 The Add a Link window enables links to events, tasks, notes, or contacts to be added to other events, notes, tasks, or contacts. When a link is defined, it is bidirectional. 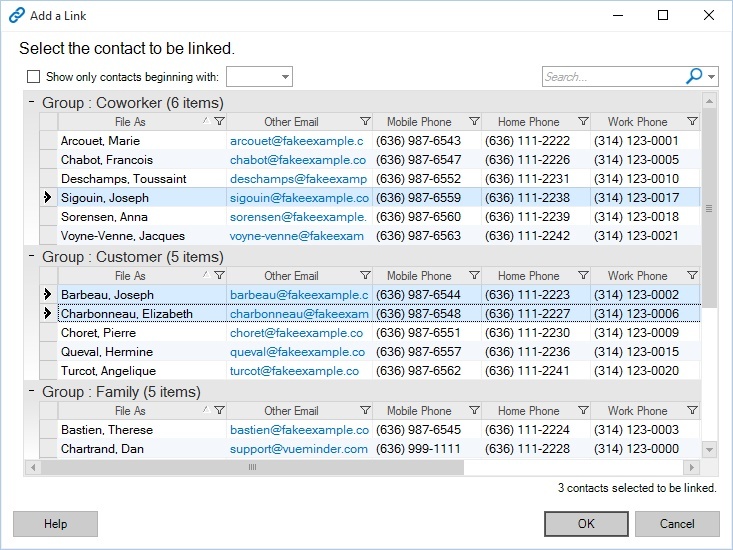 For example, when a link is added in the Task Editor to a contact, opening the Contact Editor will show the linked tasks, as well as any other items with which the contact has been linked. There are many potential uses for this feature, such as keeping a historical record of activities associated with a contact, organizing notes associated with an event, identifying tasks that need to be completed in preparation for an event, etc. 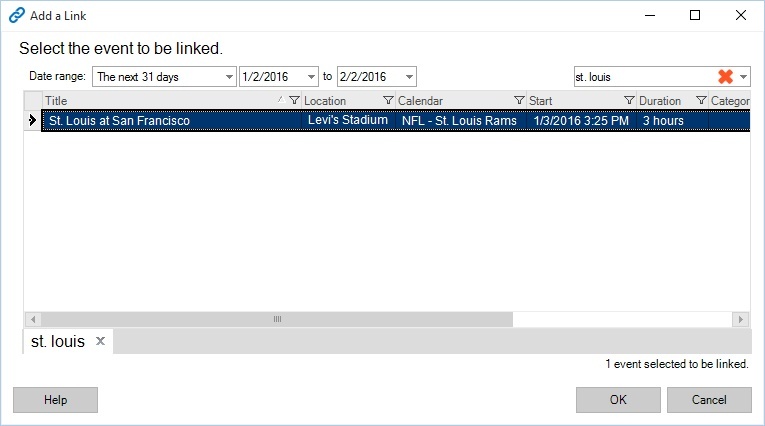 The Add Link window will list events, tasks, notes, or contacts, depending on which type of link is being inserted. The list has the same searching, sorting, and filtering capabilities found in the various list views. To select a single item, click its row. A range of rows can be selected by clicking and dragging. Individual rows can also be selected by holding the Ctrl key while clicking rows. A label above the OK button will indicate how many items have been selected for linking. After selecting the desired item(s), the OK button will close the window and insert the links into the edited event, task, note, or contact. The bidirectional links will also be added to the selected item(s) after the changes are saved. To cancel insertion of links, click the Cancel button instead of OK. The list provides the same searching and filtering capabilities provided in the list views. For example, a date range can be selected. Any items occurring outside the specified date range will not be shown (unless they are overdue tasks or have no associated date). Columns can be filtered by clicking the filter icon in the column header. 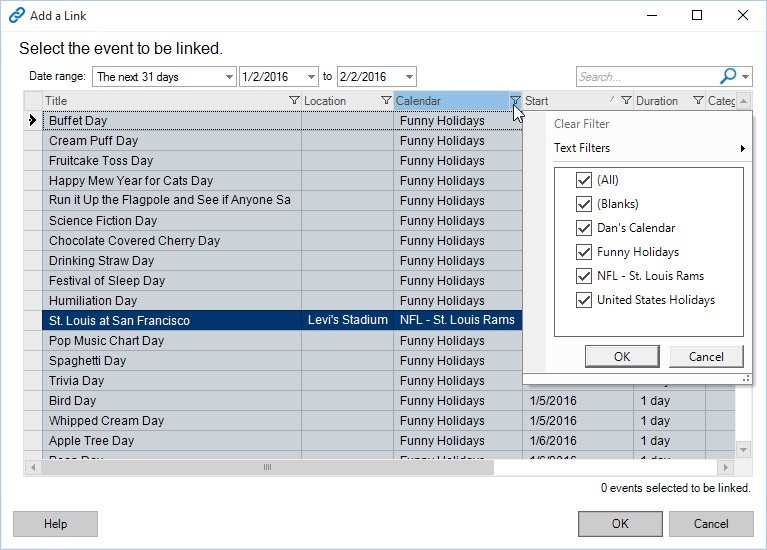 Sorting can be accomplished by clicking the column header name. Clicking again will toggle between ascending and descending sort order. Items can also be searched by typing a search string into the search box, and pressing Enter. Search results will be shown in tabs at the bottom of the list. There can be multiple search results listed. To remove all search results and return to the full listing, click the red X in the search box. Columns can be displayed or hidden by right-clicking the column header. A popup menu will appear listing the available columns. Columns with checkmarks will be shown, while those without checkmarks will be hidden. To toggle a column's visibility, click its name in the popup menu. In the Ultimate version, additional custom field columns are available under the "Custom" submenu. The "Show Group By Box" command can also be used to control how rows are grouped together, based on a selected column's values. Many additional features can be accessed by right-clicking within the list. Commands will be shown for adding or removing items, exporting to Excel, resetting filters, etc. The available commands will vary depending on the list type. For more information about these commands, see the list view documentation for the list type of interest.